Turbo Chameleon 64 is an extremely user-friendly cartridge that can be used without opening the computer. It is just plugged to the expansion port of the C64. 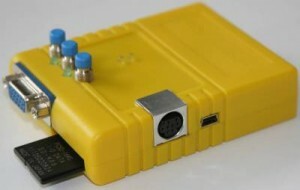 The Turbo Chameleon 64 cartridge can also be operated as a stand-alone unit (since it’s basically an FPGA computer like the C-One or the Minimig in a C64 cartridge case), replacing the computer, the floppy drive and the heavy power supply. When used as a stand-alone unit, a USB power adapter or active USB hub can be used as a power source. New VGA controller with new modes and VIC-II sync. Tripple buffering mode added for properly displaying IFLI pictures. Scale-2x video scaling algorithm added. In cartridge mode real CIAs registers and interrupts are used (allows use of a modem). In cartridge mode real VIC-II registers and interrupts are used (allows use of a lightpen). Fixed I/O assignments for FPGA (lower power use). BUGFIX: fixed error handling and timeouts of the IEC routines, which makes all related operations more robust. BUGFIX: added missing timeouts to SD-card functions. Joystick port 1 now also works for navigating the menus. BUGFIX: on some C64s pressing shift would result in phantom keypresses (F1/F2) under some conditions. Improved loading speed of file inside T64 images. Improved keyboard handling to make the browser a bit snappier. BUGFIX: the size of the character ROM saved by the ROM saver was incorrect. BUGFIX: .wav player stops at the end of the file and does not continue playing garbage. BUGFIX: files bigger than 2k are displayed correctly by the .txt viewer. BUGFIX: when copying files out of a t64 image the resulting file was missing the last two bytes and/or the last block was missing completely. BUGFIX: filecopy from/to a IEC device did incorrectly abort after 1 block. BUGFIX: filecopy filename character set conversion was broken. BUGFIX: AR/RR ROM was not correctly disabled when autostarting programs from the filebrowser with AR/RR enabled as default cartridge. fixed REU, transfer length register is 1 after a transfer completes. fixed REU 512K wrap around. faster SDRAM controller. More memory bandwidth for turbo. added slowdown modes to the Turbo settings. Offering CPU speeds of 25%, 50%, 75% and 100%. added native updater program (see manual) to update the fpga core without an usb connection. make menu item active when pressing a hotkey, so it is selected when going back to the respective menu. correctly mute/unmute second sid in menu freezer. clockport- and rr-net- items in options menu are correctly disabled if either is not available. improved navigation in one panel mode, cursor right enters subdir/image and cursor left goes one level up. improved quickfind, just type a filename quickly to jump to it. mount menu is skipped if there would only be one active item. when returning to the menu from the sid player by pressing left/menu button it will go directly to the filebrowser. set $030c-$030e to 0 before starting prgs, increases compatibility with certain packers. .sid files which actually contain a basic program can now be run correctly. re-read destination panel after copying image. Implemented bit-fade in SID when no waveform is selected. Implemented bit-fade in SID when reading write-only registers. Added bits to detect in menu when disk-images need update after write actions by the emulated drives. Implemented “door” on emulated drive, when open drive will read dummy bytes. Fixed CPU instruction timing bugs discovered when comparing emulated 6510 against real 6510. Implemented bit-fade on I/O port of emulated 6510. Fixed SID stereo mapping for D500 and D700. Four timers added at addresses D0AA to D0AD for menu (it can’t use CIA timers when freezing). Turbo speed increase: Eliminated one clock cycle from critical path. Turbo speed increase: Writes to memory concurrent with next instruction fetch. Turbo speed increase: MMU caches last used CPU slot. Fixed RAM mirrors for 1541 drive emulation. Fixed reading from emulated SID. Disk track lengths set to 6256, 6672, 7144 or 7696 bytes. Input latch emulation in VIA emulation. Implemented SDR register in CIA. Implemented real IEC bus disable bit. 1541 emulation: fixed IEC timing. All known speedloader problems are gone now. 1541 emulation: VIA6522 timer fixes. 1541 emulation: VIA6522 register r/w fixes. Auto speed option for turbo feature. Slows down on IEC bus accesses. PS/2 Page up/Page down alias for F1, F7. Easier navigation in the File-Browser. Fix D030 mirror of the turbo bit emulating C128 2Mhz mode with Chameleon turbo. Eliminate spurious resets by masking reset line in standalone mode. Fix keyboard matrix so joysticks are properly emulated (IR, numpad) in standalone mode. Framebuffer writes now use MMU. Chameleon can use real BASIC and Kernal ROMs in machine in cartridge mode. Relative CPU speed displayed in VGA debug bar.